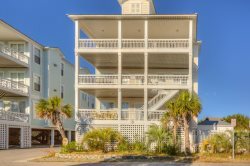 This vacation condo on Kure Beach provides all the accommodations you need to enjoy and relax on Pleasure Island. When you first walk into your oceanfront condo you'll immediately see just how close the ocean really is. From your covered porch you can marvel at the beauty of the ocean. A beautiful sandy beach is just a few steps away with direct beach access and an outdoor shower. If you're any early bird you can have your coffee on the deck and watch the sun rise over the Atlantic, a breathtaking sight to behold. Watch the dolphins play and the pelicans soar - how can you not find relaxation here! We have a covered parking area directly under the condo for two cars so you won't have to worry about your car baking in the hot sun. Also, because we're on the first floor, you won't have to lug your suitcases and all your food too far. Your vacation rental comes completely furnished including: tile entryway and hardwood flooring, a smooth-top stove, three flat screen TV's, DVD player, and comfy beds with great mattresses. Because we are an end unit you have added windows on the side to let the sun in. The master bedroom suite is on the second floor, has a tremendous ocean view, a full bath, and a comfortable king size bed. The second bedroom is also a suite with a full bathroom and a queen size bed. Add in the queen sleeper sofa in the living room and a third full bath on the main level and you'll find six people have plenty of space. We hire only the best cleaners to make sure you don't have to worry about the cleanliness of the condo when you arrive. Just walk right in and start enjoying your vacation. We have rented condos from A1 Property Management several times now over the past few years while our daughters attended UNCW. Dave and his daughter have always been very easy to deal with, promptly assisting us when we had problems opening the windows at one condo, and efficiently extending our stay when we've requested to add on a day at either end of our initial booking (for some reason, we seemed to do that quite often). This condo is a two-level end unit. It has been updated throughout - wood floors, granite counters, Bosch dishwasher, and it is very apparent that the owners take a lot of pride in it. The kitchen is well stocked with knives, a blender, Cuisinart coffee maker, wine glasses, virtually everything you'd need for a stay at the beach. It is oceanfront, so views from both decks are lovely. Three pier remnants and the Coquina rock outcropping are right in front of the condo, which is fun for older kids to explore, but is not the best for swimming. You'd want to move up the beach a little way to avoid these obstacles. Not a big deal, but best to be aware. Our third time renting from A1 Property Management. Always available and we'll continue to use them for our beach stays! The condo is beautiful. Deck was spacious and you can't beat the view!! Indoor pool at the rec center is great for this time of year! David was great! He was always available and helped me through making big decisions about the weather and gave me a lot of options! The property was clean, updated and the view was impeccable! Very pleasant staff. We had a problem with the wireless internet and they were able to talk me through a fast solution on the phone. We have stayed in other Ocean Dunes properties and this is by far our favorite. Beautiful renovations, especially kitchen and bathrooms. The view is incredible!